Right now, San Onofre is limping along at 25% of capacity. The plant could even be shut down by its owners due to economic reasons (that's what shut down Unit One). Their employees are expensive, their new equipment, which cost about a billion dollars to install, doesn't work because it wasn't built or assembled properly, the employees at the plant -- even the hordes of new ones -- falsify records, they are intimidated and intimidating, they poison the atmosphere with their lies about being a clean energy source, as well as with radioactive particles.... San Onofre is costing their parent company, Edison International, a fortune just to stay in business in the hopes they can get things squared away for another 20 years of high-risk, dirty, dangerous operation... or maybe 60. Nearly 24 years later, Chernobyl is still a dirty place, a dirty word. Chernobyl has almost surely killed hundreds of thousands of people, perhaps already it is more than a million. And over time, it will kill many more. In fact, many estimates are that the vast majority who will be killed or harmed by Chernobyl were not even born at the time of the accident. This is the legacy denied by the Nuclear Energy Institute (NEI, the public relations arm of the American nuclear industry) and other nuclear supporters -- including the International Atomic Energy Agency (IAEA) and the World Health Organization (WHO, which submits all its regulations to the IAEA for approval). IAEA and WHO admit to a few thousand dead. The NEI claims that only 38, or "under 50" people were killed due to Chernobyl (their exact guess changes now and then, but never by enough). But the truth, like the poisons, seeps out anyway. A new book about Chernobyl was recently published in the Annals of the New York Academy of Sciences. The book's esteemed authors collected several thousand scientific studies about the after-effects of the Chernobyl meltdown. Until now these studies have never seen the light of day in America, mainly because both America and the countries of the former Soviet Union, as well as all the other nuclear nations of the world, do not want this information "scaring" the public. It IS scary, but it's worth knowing! The book, painstakingly edited in English by Dr. Janette D. Sherman-Nevinger, is both shocking and depressing (this author had the honor of co-writing an article with Dr. Sherman in 2009, published in Friends Journal). The book is 335 pages long, and nearly every page has about two dozen studies described briefly (more than 33,000 studies of Chernobyl's effects have been done; they could not all be reviewed or included in the book). It's stupefying. One goes numb. One can't believe the figures (and occasionally, in part due to translation errors from the European mathematical conventions to American notation, the figures undoubtedly ARE wrong). But taken as a group, the evidence is overwhelming. So many numbers to absorb! But fear not: The authors have thankfully provided dozens and dozens of graphical charts. After a while, when you turn to a new page and see a new chart, you can put your finger on "1986" virtually every time (some effects are delayed). Things start to go wrong in dozens of countries: Birth rates go down, perhaps due to people being cautious about having children right after Chernobyl, or perhaps due to unrecorded miscarriages, or both. Age at time of death is down, childhood leukemia is up. The list goes on and on and on. Chernobyl has killed as many as a hundred times more people than the next-biggest industrial disaster in human history, generally considered to be the mass chemical poisoning in Bhopal, India in 1984. Chernobyl has probably killed more people than the atomic bomb blasts at Hiroshima and Nagasaki combined, including their horrible (and continuing) aftermath. To this day, the nuclear industry pretends that Chernobyl killed only as many people as might die in a train wreck, or maybe in a bus going over a mountainside. Sad, but nothing substantial. Chernobyl kills every which way imaginable. But the NEI and other pro-nuclear advocates only count obvious, unmistakable, indisputably-attributable deaths. For every death they acknowledge, their methodologies inevitably miss tens of thousands of deaths that were, in reality, caused by Chernobyl. One could dismiss their estimates out-of-hand as being the work of fools, but the problem with doing that is that a lot of fools believe those estimates. The more reactors we build (if we build ANY more) and the longer we let our old reactors continue to operate, the greater the likelihood that a Chernobyl-size disaster will happen here. Many U.S. reactors are now well beyond their designed-for years of operation, but the old clunkers are kept going by a corrupt regulatory system that refuses to do its job. And then there is the spent fuel. A catastrophe just as big or BIGGER than Chernobyl could happen in any spent fuel pool, or any dry fuel storage cask, at any time. These imperfect and inadequate storage methods are subject to earthquake or construction failures, as well as terrorists, tornadoes, tsunamis, even asteroids! No one can rightly claim that our nuclear facilities are secured -- not even against rogue employees. We have built the seeds of our own destruction into our environment. We should be reducing the risk, not increasing it. But what if we are led to believe that the "disaster" would be minor? What if we are told that wildlife is flourishing in the "exclusion zone" around Chernobyl, now that there are no humans? Would it make us happy? Or would we look for the underlying facts: Birds and other animals can't read signs saying "KEEP OUT!" (in any language). So yes, there is wildlife in the "exclusion zone," but there is strong evidence that many of the creatures are dying when they get there. They don't reproduce properly, and more birds and other animals from the nearby, less-contaminated areas come in to replace them, and this just keeps on happening. Migratory species pass through, eat Chernobyl's plants and animals, which are often highly irradiated, and then leave their droppings (or die) elsewhere, in a continuous, deadly, but gradual cycle. Chernobyl had a poor design. The operators were running unauthorized experiments without proper safety equipment ready. There was no containment dome. Well, that had pluses, actually. In fact, it saved the day in some sense, since they were able to pour sand, lead, and other materials directly onto the hot reactor from helicopters flying overhead, through the invisible radioactive plume. Otherwise, the reactor might have burnt completely. As it was, "only" about 3 to 5% of the reactor core was dispersed into the environment. The rest sits there to this day, still hot thermally and radioactively, still seeping nuclear poisons into the ecosystem, untouched for the most part. Covered once with a poorly-built concrete sarcophagus, it is soon to be covered again. Right now, water gets in, and then radioactive crud oozes out. Radioactive gasses seep constantly from the numerous cracks in the "vault". What once were some of the richest agricultural areas in the world are now foraged by scavengers: Poor, uneducated people who drift into the "exclusion zone" that surrounds the plant, where only authorized people taking proper protective measures are supposed to go. Chernobyl's pollution is still spreading. The soil holds the cesium and the strontium and other radioactive elements, until years of rain bring them down to the roots of deep-root trees, which take them up to the surface again. Then a wildfire burns those trees, and a cloud of radioactive crud is wafted onto some other community downwind from Chernobyl. Of course the dose will be lower, but the damage will be more widespread. Currently, most of the radiation doses that the residents of the contaminated regions are receiving are from the food they eat and the water they drink (mostly the food), not the air they breathe (although that too is poisoned). Chernobyl changed the definitions of words and gave us many new phrases which the book discusses. Perhaps the most well-known new term is: "Children of Chernobyl." Each year, a few hundred young children, usually with thyroid problems but always with health problems, are brought to "healthy" environments such as Southern California, USA (where this author lives and got bladder cancer a few years ago). There is always a lot of media publicity about the children, which is good for the organizers, fun for the children, and useful for the public, who are thus reminded each year of the horrible events that occurred in Chernobyl 24 years ago next month. The downside is that the public is led to believe that helping these few means the problem is being properly handled. There is, for the most part, no assistance for most of the millions who have been harmed. Normally, and thankfully, only a small fraction of children are born with health problems. In areas that were heavily contaminated by Chernobyl's invisible poisons (invisible, but relatively easy to measure IF you have the money, the time, and the equipment), 80% of the children are born with health problems. In very heavily contaminated areas, 98% are not healthy. One of the "solutions" recommended in the book -- presumably out of desperation -- is better testing of fetuses, and abortions if the findings are severe enough. Another new term that came out of Chernobyl is "Chernobyl AIDS." One of the main ways that radiation damages the body is that it weakens the immune system, leading to death from infectious diseases that the person might have otherwise survived. "Chernobyl babies" are children who have serious malformations such as organs outside their bodies, shortened limbs, or no brain (only a brain stem, so they breathe, but can never think). Some have essentially no bones -- they are called "jellyfish children" and the only other place they have been seen was on the Marshall Islands after nuclear weapons testing in the 1950s. The children of liquidators are especially likely to be "Chernobyl babies." What a thing to look forward to if YOUR nuclear power plant melts down, or if its spent fuel burns up, or if some other catastrophe causes another massive spill! Or if your local nuclear power plant just leaks too much tritium, like so many do. If you live in the northern hemisphere (as most of us do), Chernobyl is blamed for about 2% of what is now called your "natural background radiation." But one should not be too encouraged to hear that it is "only" 2%. For one thing, it is reasonable to believe that the background radiation, which is unavoidable, is also the root cause of many cancers which have no other obvious cause. Second, the actual value for some places may be much higher than the "average" for the whole planet (or a little lower). There are millions of hectares of farmland which still have significantly higher radiation levels as a result of Chernobyl. Monitoring what is being fed to people who already live in contaminated zones is one of the most important tools for protecting them from the damages of radiation. Needless to say, it's expensive and is rarely done. Another problem is that companies which know they are "over the limit" with some of their supplies mix the contaminated food with less radioactive food so the average dose is legally permissible. But the same amount of radionuclides are being dispersed into the population. It's an inexcusable crime that happens all the time. The "Red Forest" is the area immediately surrounding Chernobyl -- hundreds of square miles -- where the trees have turned color for some unknown reason. The "Chernobyl effect" is an increased thyroid cancer rate. There is also an increased mortality rate if you do get the disease (perhaps because your entire body is already degraded by the radioactive poisons). We all are degraded by Chernobyl. Chernobyl's radioactive isotopes continue to invade us all. The general term for what Chernobyl has done is "geobotanical catastrophe." Like the "Children of Chernobyl," "Physicians of Chernobyl," "Widows of Chernobyl" and "Liquidators Unions" are large groups of people who have been adversely affected by the tragedy. "Chernobyl limbs" are deformities of the arms and/or legs, more common in the more contaminated zones. "Chernobyl heart" is a malformed heart which does not do its job properly. "Radiation in utero" is the poisoning of a fetus in the womb, also an ongoing problem. Other new medical terms arising from the Chernobyl disaster include "vegetovascular dystonia," a nervous system breakdown, "incorporated long-life radionuclides," and "acute inhalation lesions of the upper respiratory tract" which are mainly seen in liquidators, and include a combination of: "rhinitis, throat tickling, dry cough, difficulty breathing, and shortness of breath, owing to the effect of inhaled radionuclides, including 'hot particles'." Chernobyl illnesses are no fun. "Typical complaints from liquidators" include: "severe headaches, not relieved by medication, impaired memory of current events, general weakness, fatigue, diminished capacity for work, generalized sweating, palpitations, bone and joint pains and aches that interfere with their sleep, sporadic loss of consciousness, sensation of fever or heat, difficulty in thinking, heart seizures, flashes, loss of vision, and numbness in hands and feet." Chernobyl's tendrils of poison have only begun to spread. Inadequate containment measures ensure that more of the original reactor core will leak out of the site, into the environment, and into our bodies. Chernobyl's radiation has damaged hundreds of millions of people, if not billions, and continues to do so. The truth about the Chernobyl catastrophe is being systematically hidden from the people, especially in every country with nuclear power, by their governments and by their nuclear industries. It is good to read the truth, but it hardly feels like a breath of fresh air. Hoffman is an educational software developer and the author of The Code Killers, a technical guide to the nuclear industry. 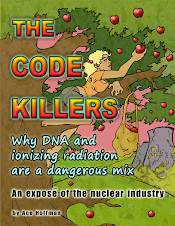 The Code Killers is available as a free download from the author's web site: www.acehoffman.org . Written by Alexey V. Yablokov (Center for Russian Environmental Policy, Moscow, Russia), Vassily B. Nesterenko, and Alexey V. Nesterenko (Institute of Radiation Safety, Minsk, Belarus). Consulting Editor Janette D. Sherman-Nevinger (Environmental Institute, Western Michigan University, Kalamazoo, Michigan).